January | 2009 | live. laugh. love. So, I got a laptop for Christmas and almost immediately I started looking for laptop bags so that I could cart it around town (because I’m just so cosmopolitan that you’ll often find me perched in trendy coffee shops sipping a latte while I stare intently into my computer screen…or not). I’m trying to be enamored with it in person. I’ve shown it to people and been all, “isn’t it great?” And really, it is. It’s a well made bag. I fits all the requirements I had except possibly the cute one. It looked so cute in the picture but in my hands? I feel I should be stuffing diapers, wipes & bottles in there. On one hand, I feel as though I should keep the bag and get over my whiny self, on the other hand…why keep it if it’s really not what I thought it was going to be? Y’all, I’m not a shopper. I’m severely decision challenged. Choices overwhelm me. Plus, I was on a budget. I wasn’t going to spend more than I paid for the first bag. Yadda yadda yadda, long story longer…cute laptop bags in the mall aren’t cheap, even on sale. I look at largish handbags…still not seeing anything that fits my criteria. In Macys I find a Fossil purse that it just so cute! But…not big enough for the laptop. I eventually find myself in Dillards wandering through more expensive bags when I spot the same Fossil bags I’d seen at Macys. But these are marked 50% off and on the very top shelf is a bag that is big enough for my laptop! Now, it’s not technically a laptop bag, so I know I’m going to have to find something to add protection and cushion but it’s supah cute and $10 less than what I paid for the first bag. And then…when it rings up at the checkout counter? Another 30% off!! Fossil, FTW! And there you have it. The Great Laptop Bag Hunt of ’09 has come to an end. I faced my indecisiveness head-on and prevailed! I think I’m well on my way to year of thriving! Disclaimer: I don’t expect any sympathy over this faux-tragedy. Believe me, I know that in the grand scheme of things, this is so low on the list of ills and discomforts that it’s not even laughable it’s really rather pathetic. “Choosy Moms choose Jif!” Or so the commercial always told us and I was a proud choosy Mom! Nothing but the best for me my family. I never really thought I was a brand snob until I decided to try and be more frugal. It’s amazing how blind we can be to our own faults. I was so sure that I only bought a few “brand name” food products and that “for the most part” I picked up off brand or store brand items. Then I took a good hard look into my cabinets and realized how brand name heavy my purchases really were. Not that there’s anything wrong with that! But like I said, I’m trying to be more frugal and reality is, brand name costs more. My most recent grocery list included peanut butter, smooth and chunky, because that’s how we roll around here. I usually buy the large jars of it so that it lasts more than a week (seriously, the GMan practically eats his weight in peanut butter each week). I’d never paid attention to how much those jars of Jif were costing. Two jars come to $13! Thirteen dollars worth of peanut butter? The store brand cost almost $2 less. Two jars come to around $9. So I put the store brand in my cart and you know what? It’s good! I think I can used to this letting go of stuff and making some different choices. And with the four dollar savings (four dollars! ), I can still get my favorite coffee creamer. Because Coffee-mate is your coffee’s perfect mate! What? So, I still have a ways to go! An all-time favorite meal in our home is chicken pot pie. But with JBelle taking the vegetarian route I figured that was no longer an option for us. I got to thinking about it though and it occurred to me that I could do the dish without the chicken. However, there was something about it that seemed a bit unappetizing to me. I thought on it a little more and the idea formed to make individual pot pies with a veggie only filling. Much to my amazement, it was hit and so the Veggie Pocket was born! Mix all the veggie filling ingredients together in a bowl and set aside. Cut the butter into the flour using a pastry cutter until the mixture is well incorporated and looks like course crumbs. Add the milk and stir together (dough will be sticky). Turn the dough out onto a well floured surface and roll out with a rolling pin to about 1/4 to a 1/2 inch thick. Use a cookie/biscuit cutter to cut out circles. Once you’ve cut out all your circles, one at time roll out each circle until it’s roughly twice the size it was before. Put a spoonful of veggie filling onto one circle. Then using some water, wet the edges of the biscuit with the filling on it and the edges of another biscuits. Place the second biscuit on top of the veggie mixture biscuit and seal the edges together. Then, if you like, you can crimp the edges with a fork. Using a fork, poke the top a couple of times to vent. Place them on a cookie sheet and bake at 425 degrees for about 20 minutes or until crust is a light golden brown. golden brown & ready to eat! Did you get you some new undies last week? I did! 😉 The Diaper Diaries I Cor 7:3 Week 3 Challenge is up…head on over and shed a little light on the subject! Unless you can figure out how to play Wii bowling left handed, you are hearby banned from the activity until you can have shoulder replacement surgery. Wait. Is there such a thing as shoulder replacement surgery? My submission for this week’s “I am Blissfully Domestic“, is the Menu of Ailments story about pretend play with the GMan. 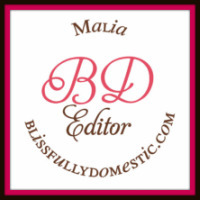 Won’t you share how you’re Blissfully Domestic, too? I’m terrible about making compliments to others. It’s weird because I’ll see someone and notice something about them and compliment them in my head but never say anything out loud. I think I’m afraid it will sound trite and insincere. Which is also weird because I truly appreciate it when someone gives me a compliment. And then there’s the awkwardness of having someone pay you a compliment and you graciously accept but don’t compliment back. I’m never sure what to do in that situation. Again, it seems like it’s insincere to compliment back just because you were given a compliment. And most of the time, I’m not quick enough on my feet to say something truly flattering. Just the other day, someone complimented me, twice, very sincerely and graciously and all I could do was say thank you. I felt like I must be so self-centered to take a compliment but not give one back. How do you handle compliments? Are you good at giving them? Do you always compliment back? It’s Mouthwatering Monday! I’m cheating a bit today. I didn’t make anything particularly mouthwatering last week. In fact, we struggled quite a bit with trying to help and support JBelle’s decision to be a vegetarian but not eat mac ‘n cheese or pb&j every day. It was just one of those weeks where nothing seemed to appeal to her. I tried a new recipe, she didn’t like it (actually, I was pretty much the only one who did like it). I made a pasta dish, she ate it but GMan didn’t and yesterday I threw the rest of it out because there was no way it was going to be consumed. Finally, this weekend a couple things actually went right! On Saturday, I picked up some Boca Burgers for her. She had one for dinner Saturday night and loved it! On Sunday, we had baked potatoes and salad, she liked that, too. Yay! Just click on the picture and it’ll take you to Home-Ec 101 for the recipe. Gotta go…I just got a hankerin’ for biscuits! No, one more thing….be sure to check in at The Diaper Diaries for this week’s 1 Cor. 7:5 challenge! It’s a fun one!